Passed in 2009, Senate Bill 233 » protects the constitutional rights of crime victims and established the Attorney General’s Task Force on Victims’ Rights Enforcement (AG Task Force). 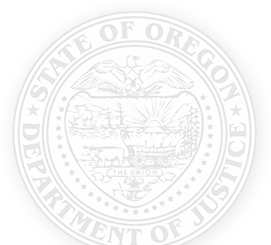 The AG Task Force develops legislative recommendations to further improve the protection of victims’ rights in Oregon. For more information, please see a brief history of the Attorney General’s Task Force on Crime Victims’ Rights. Four years later, the Attorney General’s Task Force on Victims’ Rights Enforcement (AG Task Force) was established. Attend and participate in quarterly meetings. Provide guidance and feedback for the subcommittees. Report back to constituent groups. Provide constituent feedback to the AG Task Force. Actively participate in one or more subcommittees. Recruit staff members or constituent members to serve on subcommittees. Mission: Develop ways to report, review, and resolve noncompliance of victims’ rights through a non-judicial model. Mission: Develop a comprehensive and viable plan for implementation and enforcement of victims’ rights through a fully accessible training design. Mission: Measure the implementation of and compliance with crime victims’ rights in the justice system through ongoing data collection and evaluation. Mission: Identify and recommend models of restitution assessment, collection, and distribution for system improvement. Mission: To ensure that crime victims’ rights are clearly and consistently understood by all victims of crime and to identify means of communicating these rights throughout the state. Mission: Ensure foreign born victims of crime are informed of their rights and to identify areas for improvement in system practices. Mission: Identify crime victims’ rights in the juvenile justice system, develop a best practices model for implementation, and create a training model for sustainability. Mission: Ensure victims’ rights will be clearly and consistently understood by crime victims and that crime victims have every opportunity to fully exercise their rights through a best practices model.